The first time we prepared Roasted Goose for International Dinner Christmas Party where we have shared traditional meals with our friends. This year we had dishes from Poland, Germany, Slovakia, and Italy. We have started with homemade Slovakian sausage from our friend Katarina who got the recipe from her grandfather and has it produced here in Germany. The sausage was delicious – a little spicy – perfect! I was so glad I got some of those for Christmas this year! As an aperitif, really we served mulled wine. As a second and third course, we had two polish dishes you know already: pierogi and creamy mushroom soup. The Polish Christmas Dinner always starts with the soup – which is either beetroot soup with mushroom dumplings or creamy mushroom soup. In my family, we prepared the mushroom one, although after time, when we started spending Christmas with my cousins, we served both of them! Pierogi for Christmas is usually filled with sauerkraut and mushrooms. There is undoubtedly a lot of mushrooms on the Christmas Dinner table in Poland. 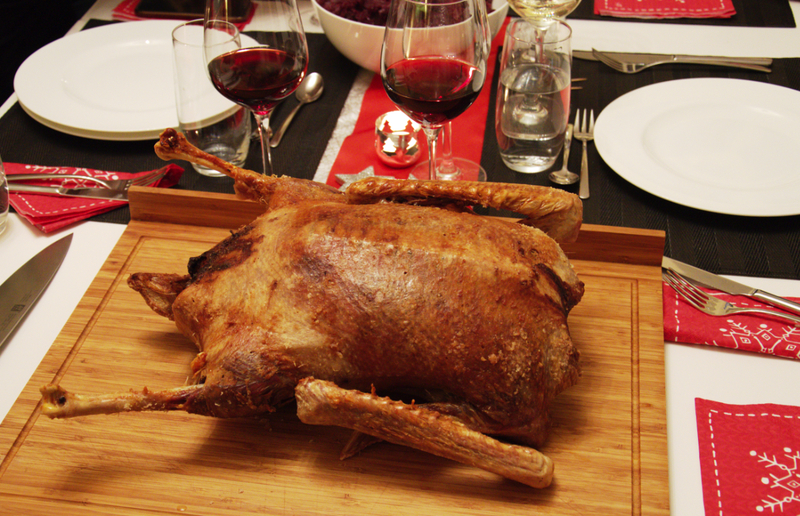 As a next course, we had roasted goose to which you can find the recipe below. Preparing the 5kg bird was time-consuming. It took over 5 hours for the goose to be ready. The goose turned out amazing! 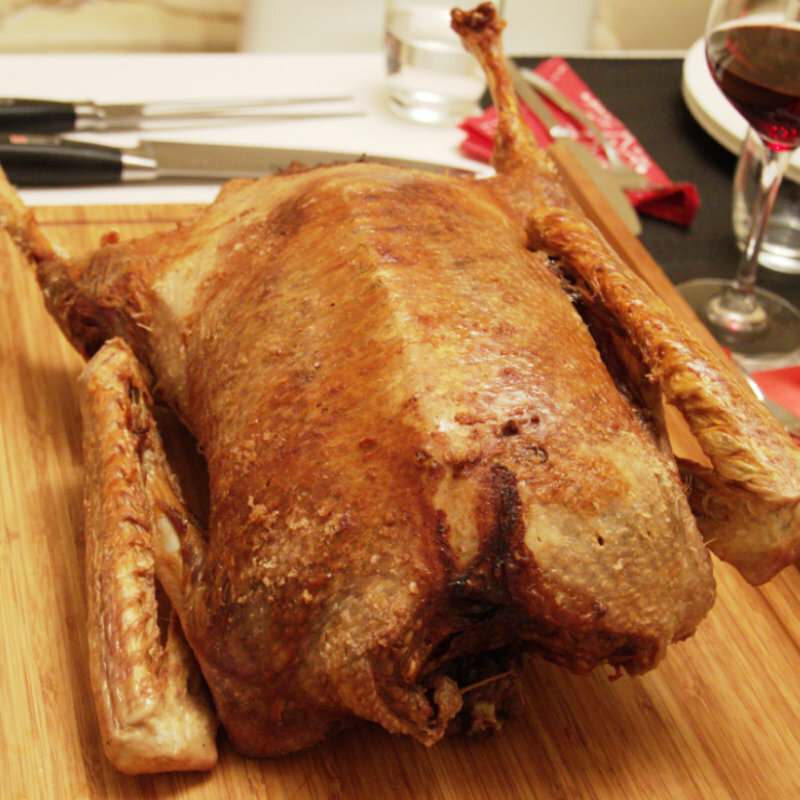 I have never thought that this bird can be an as good roasted duck! Traditionally we cooked potato dumplings (from raw potatoes) and German red cabbage with apples. We have finished our dinner with Pandoro with Zabaione and Slovakian Metrowy Kolacz. The Slovakian cake tasted like my childhood – my grandmother used to prepare the same pound cakes and very similar cream for our birthday cake. I have never expected you can combine those two things, pour chocolate on it and enjoy. This did surprise me. Well done everybody, I think we did great! Check and clean the outside and inside of the bird and remove any giblets. Rub the bird with salt from outside and inside. Stuff the inside of the goose with bread roll mixture. Make sure that you sew shut the opening of a goose. Place the bird in the cold oven on a wire rack breast down. In this way the fat will drain into the tray below. Turn the oven to 160 degrees and set the timer for 45 minutes. After 3 hours turn the bird up side down and roast it another 1,5h. 15 minutes before taking out the bird brush the skin with very cold water - for the skin to be shiny and crispy. Remove the bird from the oven, take out the filling and make sure there are no threads. Take out the fat with the juice from the freezer and separate fat from juice. Place the juice in the casserole, add cherry juice and cranberries and thicken it (for example with butter and flour mixture). Season it with salt, pepper and sugar. Serve the bird with red apple cabbage and potato dumplings. Cut the bread rolls into small cubes. In the large bowl mix the bread rolls, eggs chive and milk. Season with salt and pepper. Going to Frankfurt, Germany? Check out this grocery shopping tour for traditional food and drinks from Frankfurt that you can enjoy back home with your families and friends!